I've had a smartphone for almost two years now, and I've used emojis on a regular basis for about three months. I was just never really that into them. I like the good old fashioned :) and if I am feeling really saucy, there's always room to spill over into C: and the like. We've got a whole 26-character alphabet of options! But of course, I did eventually give in to the magic that is the world of emoji. There are just so many options! I started to pay more attention to the way people use them, and I think Instagram is where they thrive the most. One crazy phenomenon I have noticed: people try really hard to find emojis that match the visual style of an instagram post. For example, see above. Those nail decals are pretty darn cute. But hey oh my gosh, there were the perfect emojis to copy the theme perfectly in the comments! It must be related to my undying love of miniature versions of things. This one is kind of funny. The emojis aren't copying the theme of the photograph, they're actually an exact replication of the photo as translated into emojis. This is getting pretty deep. And here we can see art imitating life, which in turn is imitating life. Look, ma! I found a leaf that looks just like my iPhone 6 Plus! I didn't know these things grew on trees. I wonder if it's rare. Oh wait, there's an emoji for it! Must be common, then. And I loved the idea so much, I did it myself. Don't go thinking I didn't put any thought into this either, I went through almost every menu and chose from at least five triangular-shaped emojis, ok. I put the time in. Not to mention the metaphorical meaning. Tess loves Oatcakes more than diamonds. They are both precious and rare. As with any new language, there is some discrepancy over meaning of certain emojis. I really enjoyed the little debate that happened over whether a certain emoji was representative of a pair of hands praying, or two different people's high-fiving hands. You know the one I mean. "Definitely praying. If it were two different people high-fiving, their sleeves would be different colours!" "High fives for sure. Why would there be religious emojis? That's just wrong." "It's a person praying! 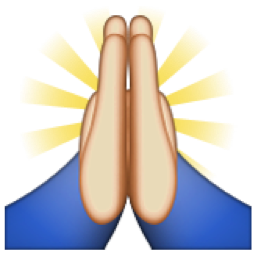 There is another religious-themed emoji (see below left), so would it be so far-fetched to have two? "It's ambiguous. 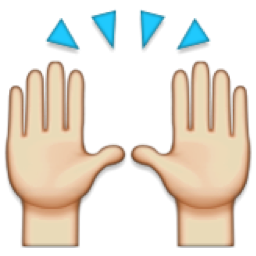 There's another emoji (see below right) that could also be either praying or high-fiving. I choose to believe it's both." Personally, I think the one on the right is clapping hands. But I guess the meaning is whatever you want it to be. That's called free speech, kids! If you want to see the article debating the whole thing, you can find it here. I think the reason I really like to use emojis now is because they remind me of MSN Messenger. That thing let you make your own emoticons! I used to make a lot of pixel art, so that sort of thing wasn't a far stretch for me. I remember that I used to customise the existing ones with hair that resembled my friends and surprise them by sprinkling my creations into our chat windows. I get nostalgic just thinking about it! Communication is a funny thing. I've heard a few people say that emojis are on their way to replacing texting language completely, and I'm really trying to resist that for myself. Much as they are expressive, I appreciate a well-written, well-thought out text. If I ask you how your day was, I really hope that it was something that just simply can't be described through emoji. Otherwise you might realize that you are really boring! Not to mention, our language could go the way of hieroglyphics and become completely misunderstood by future humanity. If that happened, how would we keep the important ideas alive, like "Girl, Becky got so fat over the summer" or "That cute guy in my math class asked me to borrow a pen!" Now I KNOW that life is also imitating art. It's indisputable proof, people!